The Redirect Manager is a component that is accessed from the back-end of a Joomla! website. It is new to Joomla! 1.6 and its main function is to provide a mechanism to give an Administrator the ability to redirect the URL of a web page which no longer exists to a working web page. You must have the Use Apache mod_rewrite option enabled in your Joomla! 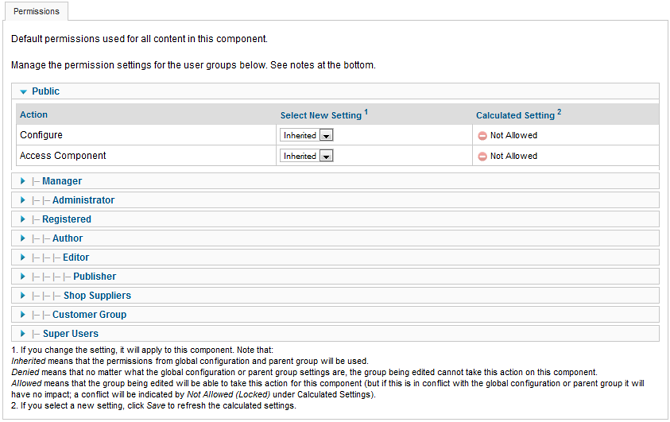 installation Global Configuration options in order for the redirects you create to function. This component is primarily used for redirecting URLs for web pages that no longer exist on your website to web pages that are working. The URL you want to redirect from must not be a working one on your website which actually loads a web page. It can be the URL to a web page which you have disabled in the Joomla! back-end administrator interface. The Source URL you specify when you create the redirect should be the full URL as you would type it in your web browser. The component will only display the last portion of the source URL in the redirect listing. The Destination URL you specify when you create a redirect must be the full URL as well. Enabled. Whether or not the item is enabled. A green circle with a white check mark in it means it is enabled. A red circle with a white dot in it means it is disabled. Below the listing of redirects, is a section named 'Update selected links to the following new URL'. This function allows you to change the 'Destination URL' for the selected redirects. Destination URL. The destination URL to set for the selected redirects. Update Links. Updates all selected redirects with the specified Destination URL and Comment. Enable. Enables the selected item. Works with one or multiple items selected. Disable. Disables the selected item. Works with one or multiple items selected. This page was last modified on 14 January 2011, at 16:09.